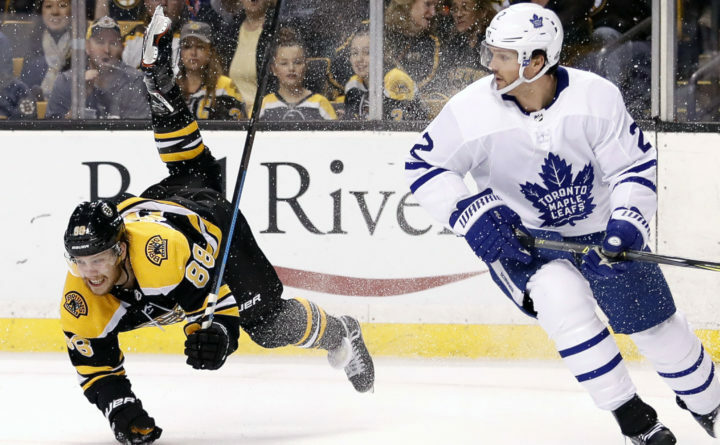 BOSTON — David Pastrnak had a hat trick and three assists to help Boston blow out the Toronto Maple Leafs for the second straight game, leading the Bruins to a 7-3 victory Saturday night and a 2-0 lead in the best-of-seven Eastern Conference playoff series. Two nights after Frederik Andersen allowed five goals in the series opener, he gave up three more on five shots in the first 12:13 before he was replaced by backup Curtis McElhinney. The Bruins added another power-play goal — their second of the night and fifth of the series — to make it 4-0 after one. Mitch Marner, Tyler Bozak and James Van Riemsdyk scored for the Maple Leafs, who never got closer than three goals down after that. McElhinney stopped 19 of the 23 shots he faced. Already struggling on offense, Toronto lost No. 4 scorer Nazem Kadri for three games when he was suspended by the NHL for boarding Tommy Wingels in Game 1. Wingels, whose injury was not disclosed, skated in practice Saturday but did not play. The Leafs could have used Kadri — and a few other scorers like him. Just 11 seconds after Ron Hainsey was given a double-minor for roughing, Nash made it 4-0.